The militia group occupying a Fish and Wildlife Service facility in Oregon is costing the government tens of thousands of dollars per day, as three federal buildings remain closed due to safety concerns. In addition to the Malheur National Wildlife Refuge facility, buildings maintained by the Bureau of Land Management and Forest Service have also shuttered due to potential security threats to their employees. Nearly 120 permanent and seasonal employees report to BLM’s district office in Burns, Ore., nearly all of whom are now on paid administrative leave. The salaries of those workers total approximately $117,000 per week, according to a BLM spokesman. The office has already been closed for more than one week. About 50 more employees work at the refuge center or the Forest Service’s Emigrant Creek Ranger District office, many of whom are also on paid leave. Federal and local law enforcement have said they will, at least for the time being, allow the armed militia members to come and go from the FWS facility freely. The White House has said as long as federal personnel are safe, they will leave responsibility for the situation to local officials. 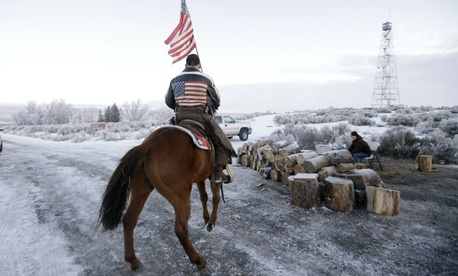 The militia group, which has occupied the FWS refuge since Jan. 2 in its fight to limit the size and power of the federal government, has now given scores of federal employees a week’s paid vacation on the government’s dime.